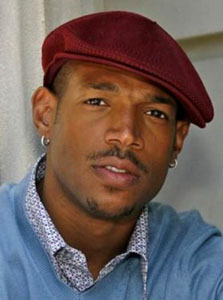 One of ten Wayans siblings, Marlon Wayans often works with brother Shawn Wayans, billing themselves as the Wayans Brothers. They are most famous for the first two Scary Movies, although neither was invited back for the third installment. Wayans made his cinema debut in big brother Keenen Ivory Wayans' I'm Gonna Get You Sucka, but it was pretty low-level nepotism; he wasn't much more than an extra. He joined In Living Color in 1992, just as Keenen was leaving and the shark was jumping. He later co-starred with Shawn in The Wayans Bros., one of the first black sitcoms that didn't seem to care whether it appealed to a white audience: "We're brothers. We're happy and we're singing and we're colored." Again working with Shawn, Wayans wrote and starred in Don't Be A Menace To South Central While Drinking Your Juice In The Hood and White Chicks. With David Spade, he made the humorless Senseless. Wayans was also in the 2004 reworking of The Ladykillers, with Tom Hanks, and showed his dramatic chops in the drug drama Requiem for a Dream. He is slated to play Richard Pryor in an upcoming biography of the comic, Richard Pryor: Is It Something I Said?